A cuddly toy monkey, hanging on a wall like a Jumping Jack. With a friendly hello the puppet starts to react to the visitor’s movements and immediately apes every gesture with its arms and legs, its head and body. You can let the ape act smoothly or invite him to a wild dace. But in a subtle way the monkey asks for another move you have never ever performed before. Playing the game you will lose control unconsciously and after the seductive encounter you might start wondering: What is all this monkey business about? Who pulls the strings? Ralph Kistler (1969, Munich/Germany) lives and works in Munich and Tenerife (Spain). He is interested in the observation of today’s society phenomena by taking his surroundings and his personal life as a reference to query everyday situations with ambiguous and often ironic artworks. To create his art installations, he works with video, electronics, interactivity or kinetic objects. His works were shown in exhibitions and festivals such as Piksel Festival in Bergen, the Transmediale in Berlin, and the Japan Media Arts Festival in Tokyo. Jan M. Sieber (1975, Heilbronn/Germany) lives and works in Weimar (Germany). He is an artist and inventor whose media installations and performances explore the phenomena, impacts, possibilities, and dysfunctions of multimodal human/machine interfaces. In Weimar he runs interactions.cc, an engineering office for interactive media. His works and his curated exhibitions have been shown in Germany, France, Spain, Italy, the Netherlands, Japan, and China. 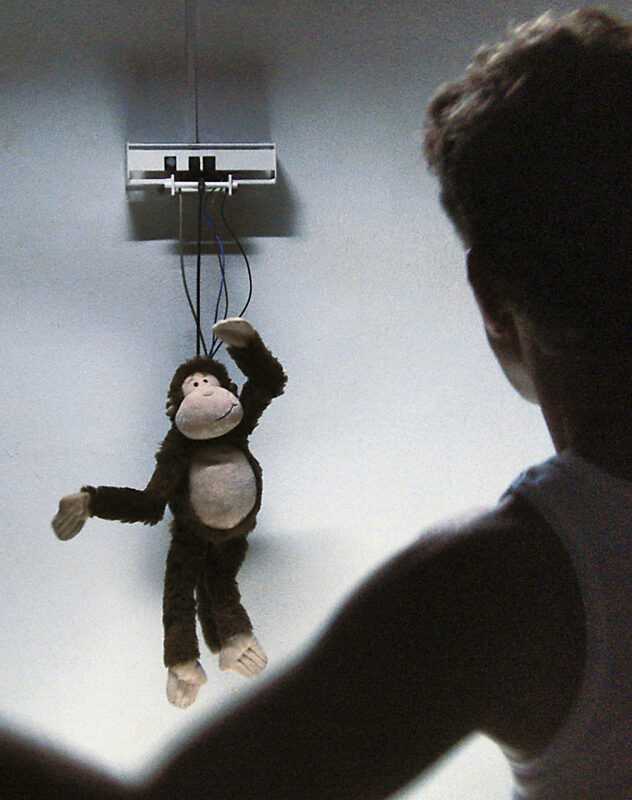 Monito (2011, Guía de Isora/Spain) lives and doesn’t need to work in Weimar (Germany). He loves to dance and to fool people. Since the release of his successful work “Who pulls the strings?”, he spends most of his time hanging out with other monkeys or hanging on walls somewhere in the world, doing nothing else but monkey business.